A Whirlwind Visit to Vietnam! Our third and final stop of my first Asian tour was a short but very busy trip to Vietnam. 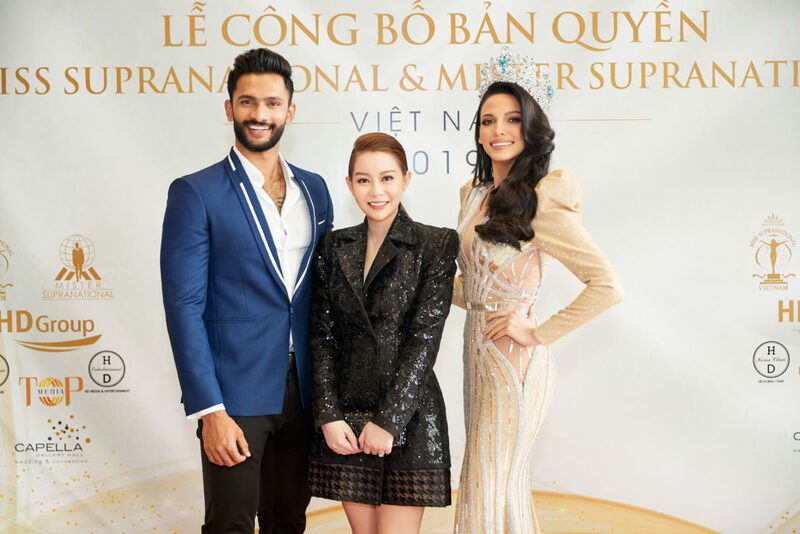 We returned to Thailand first where we met up with Mister Supranational, Prathamesh. As we had not seen each other for three months, it was really nice to catch up and hear what he has been up to. We had an early start the next morning as we made our way to Ho Chi Minh City. Upon arrival, we were greeted by a their national team and this year’s entrant, Ngoc Chau. There were lots of reporters waiting, which was a nice surprise. When we got to the hotel, it was time to get to know the local organizing team better. I felt right at home immediately because of their warmth and kindness. I am just so lucky that I get to meet amazing new friends in every country I go. They all share the qualities that embody the Supra family, so I feel like I have relatives in three new countries now. We had a welcome dinner that evening where lots of stories and laughter were shared. The next morning, I was spoiled with a special skin care treatment, which was amazing. I started feeling a little bit strange and tired the day before and it was getting worse by the hour at this point. Their team could see I was not feeling so well and the love and care they showed me was something that gave me the energy to push through. Their amazing hair and make-up team gave me an incredible look for the day and I was given an amazing gown to wear. It was a style I had never worn before, so it made me so excited that I forgot that I was feeling sick. I was ordered by the doctors to rest in bed as I had a high fever and was given some medicine. Sadly, I had to miss that night’s dinner and the next day’s charity activity as they did not want me to pass on the virus to the children at the orphanage. I was sad not be able to make it but I am grateful that Tu and Chau were there to stand in for me. That evening we had an incredible photoshoot. Despite still not feeling so great, I tried to give all my energy. It was fun to do the shoot with Prathamesh who kept the mood light and energetic. The next morning, the Vietnamese team took me to the flagship store of Vietnam’s top designer, Chung Thanh Phong. I was like a kid in a candy store – so many gorgeous gowns everywhere. They told me I could pick any one I like and I was so excited that I forgot I was sick. It was time for a mini fashion show and it was one of the hardest choices I had to make, so it took some time to choose one. After I picked it, they surprised me by telling me that my three other favorites were also now mine. I was so happy and grateful that I was very close to tears. Thank you Chung Thanh Phong (one of my new dreams is to walk in one of your runways shows) and Hai Duong. I love you! After another amazing skin care treatment, it was time for us to head to the airport to make our ways back home to Puerto Rico, India and Poland via Bangkok. Vietnam was a short but unforgettable trip. I felt bad about getting sick, because I wished I could have given them more but I hope to go back soon for another trip. I am back in Puerto Rico now and still recovering from my illness. Well, I am actually almost back to normal. I have the best memories of my trips to Thailand, Indonesia and Vietnam. I can’t thank everyone enough for their time, energy and love. It’s such a blessing to be Miss Supranational and I can’t wait for my next trip, which will start next week!! !